Two incidents occurred at the Freeport Terminal last week. The first led to the spill of an oily-like chemical when a container was accidentally hit and part of its contents spilled out into the sea. The second concerned odours resulting from the handling of fuels at the Oil Tanking Terminal. The second accident led to the precautionary hospitalisation of six employees. The first incident, on the other hand, led to the suspension of bathing activities at Pretty Bay, Birżebbuġa for a number of days. The accident leading to the spill occurred on Monday, 8 June at around noon. Yet on Friday, 12 June, personnel from the Civil Protection Department were still dealing with the spill as by this time water currents had moved it from the Freeport Terminal to Pretty Bay. It was only late on Tuesday, 16 June that the Environmental Health Department certified that Pretty Bay was once more fit for swimming. Unfortunately, such accidents are bound to happen. That they do not happen more often is only due to adequate training and the availability of the adequately maintained equipment available on site. The Freeport Terminal extension – approved five years ago by MEPA and currently in hand – is intended to tap into the container movement market in the Mediterranean even further. In the coming years, this will lead to a increased activity and, consequently, the likelihood of similar but more frequent accidents happening in the future is possible. 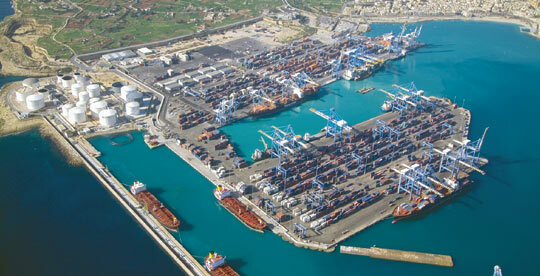 The Freeport Terminal activity is only one of a number which, over the years, have transformed Marsaxlokk Bay into an industrial port. Delimara Power station and fish- farming as well as the ever-present fuel reception points at the San Luċjan and Enemalta stations are other examples of industrial activity along the Marsaxlokk Bay coastline. We should also remember that, at some time in the near future, bathers at Pretty Bay will also have an enhanced landscape: they will be able to enjoy in full view a gas storage tanker permanently anchored just opposite the sandy beach, along the Delimara part of the Marsaxlokk Bay coastline. The spectacle will include its refuelling between eight and 12 times a year, with possibly three of such refuelling instances occurring during the summer bathing season. The compatibility of this situation with the EU Seveso Directives is debatable. All this industrial activity may be healthy when considering the general economic requirements of the country on its own. It is, however, generally incompatible with the needs of Birżebbuġa both as a residential community as well as a touristic venue. Efforts to mitigate the impacts of this industrial activity on the residential community of Birżebbuġa (and to an extent even on the locality of Marsaxlokk) are in place. Yet with so much going on, the effects of these mitigation measures are necessarily limited. In fact, one wonders why the decision to locate all this industrial activity in the area was not also accompanied by a decision to restrict the development of land for residential use so close to these industrial facilities. In one particular case, at il-Qajjenza in the 1980s, residential development was accelerated in the vicinity of the then Enemalta Gas Depot. Fortunately the Gas Depot has now been closed down and decommissioned, however it has been moved to the other side of Birżebbuġa, close to the entrance of Marsaxlokk Bay at Bengħajsa. The Freeport Terminal management, supported by MEPA, had also decided to extend the permissible facilities at the Freeport Terminal to include minor repair work to ships and oil rigs. The decision was only reversed when it was faced with the vociferous opposition of the Birżebbuġa residential community led by its local council. Recently, Transport Malta has added to the summer pleasures at Birżebbuġa. It has planned a mooring area for pleasure craft and small boats adjacent to the swimming zone, right in the middle of Pretty Bay. It seems that Transport Malta does not give a fig about the impact of anti-fouling agents used on a large number of craft berthed very close to a swimming zone. With all this activity going on around Pretty Bay, it is inevitable that that there will be an increase in unacceptable environmental impacts on land, air and sea. Some accidents will also be inevitable. As a result, however, it is very possible that in future there will be further restrictions on the use of Pretty Bay as a bathing venue. One hopes that this will not be often. It is, however, unavoidable and is the direct result of the ongoing activity which is definitely incompatible with the needs and requirements of the Birżebbuġa residents. One interesting development at the time of writing is that Hon. Marlene Farrugia, as Chairperson of Parliament’s Committee on the Environment and Development Planning, has placed last week’s incidents at the Freeport Terminal on the Parliamentary Committee’s agenda. For the time being, a request for information has been sent out. The resulting discussion will hopefully direct the spotlight on the manner in which successive governments have transformed Marsaxlokk Bay into an industrial port, in the process at times ignoring – and at other times not giving sufficient attention to the plight of the residents in the area.